Basil is definitely one of the most beloved aromatic herbs in the world. It not only comes in many varieties and it is used in many dishes but it is also easy to grow both indoors or outdoors. But even if basil is one of those herbs ﻿﻿that ﻿﻿everybody grows in a pot, it seems that many cultivators are confused when it comes to harvesting. The basil leaves don’t need to ripe so many find it difficult to understand when to harvest basil without causing damage to the plant. This is one of the questions that tormented me when I first started to grow basil. Although many gardening experts claim that basil can be harvested as soon as the plant reaches about 12 inches in height, many inexpert cultivators, such as I once was, will fear of not damaging a too young plant. With time I understood that, in fact, basil can be harvested as soon as the plant is about 12 inches tall in all safety, and that harvesting… or pruning which in the case of aromatic herbs is the same thing is essential to ensure a healthy development of the plant. Some gardeners even claim that you don’t even have to wait until the plant reaches the above-mentioned height and that you can start harvesting as soon as the basil developed a few sets of leaves. Nevertheless, as basil is a plant that grows pretty fast, I believe that it is better to wait for the plant to develop a little before passing to harvesting. 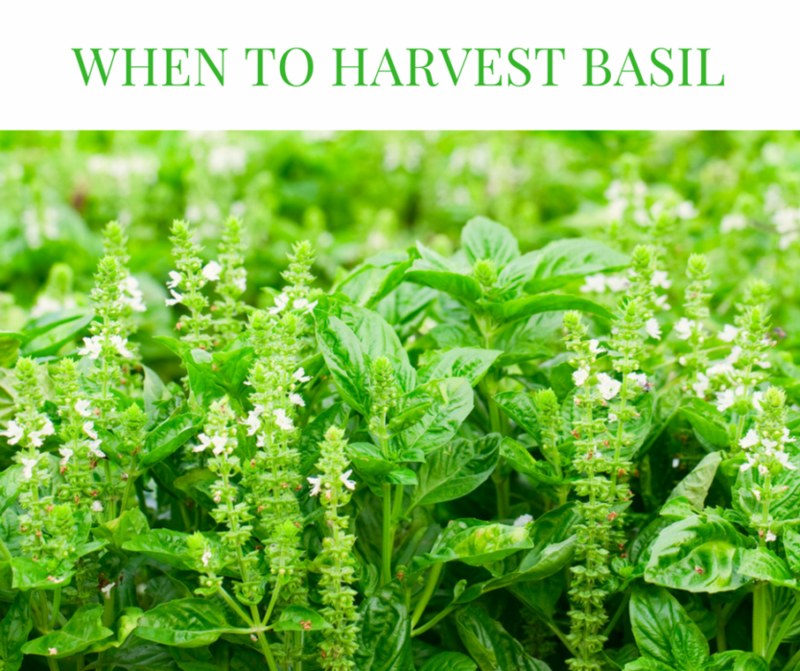 Now, let’s see a few tips on how to harvest basil. Just like I said above, harvesting and pruning mean the same thing in the case of basil. This operation is essential for the health ﻿﻿of ﻿﻿the plant since it will allow the plant to grow stronger and increase its yield. To harvest basil in the right way, there is a technique you should follow. I mean yes, you could just pull away any leaves from the plant, but that would do nothing but decrease your basil production. On the other hand, if you focus on growing the plant, stimulating it to develop new stalks, you will notice how your basil production will increase constantly. To do this, when harvesting, you should cut the stalk of the plant at the height of the second set of leaves. This will determine the plant to grow two new stalks from the cutting point. Once the new stalks developed several sets of leaves, you should repeat the same operation for each basil stalk. You will notice that, in the case of a healthy plant, you will be able to harvest new basil leaves (and prune the plant) once a week. With time, the basil production will increase since you will get to prune several stalks at once. In addition, you will be able to brag with a beautiful robust plant instead of having a “leggy” basil. If you want to keep your plant strong and healthy for a long time, you should also pay attention to remove all the flowers as soon as you notice them. If left to develop, the flowers will transform into seeds and the basil plant will die soon after. Following these tips, you will soon be able to harvest more basil than the one you need for your recipes. Therefore, let’s see how to preserve excess basil. Because many supermarkets sell dried basil, many cultivators believe that drying basil leaves could be a good preservation method. Allow me to disagree… dried basil has absolutely no flavor and it is pretty much useless. No need to despair. There are other preservation methods that will allow you to preserve the flavor of your crop and really enjoy that crisp taste. A common, and my favorite, method to preserve basil is freezing it. The procedure is simple, put the leaves in a freezer bag and store it in the freezer. Another method of freezing basil is by chopping the leaves, then place them in ice cube trays, add water or oil, and freeze them. You will be able to use the basil cubes whenever you need them. Preparing basil oil or pesto are other alternative methods to preserve basil. Now, you not only know when to harvest basil but also how to do it and how to preserve it.If you have any questions, or if you want to share your experiences with us, just leave a comment below. Great information!! Will certainly pass it on. Basil is, without a doubt, my favorite herb to grow. I personally love the Italian sweet variety. Even if I don’t consume it all, (and for the life of me I can’t think why I wouldn’t), the fragrance it gives off during a light late summer breeze is nothing short of memorable. In any event, great tutorial on the harvesting!